The GRIP FORCE GEN 123 ADPATER was developed specifically for GLOCK's GEN 1, GEN 2, and GEN 3 series of pistols. It eliminates the drawbacks associated with permanent modifications to your factory pistol. 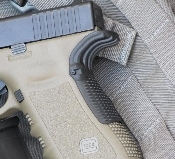 The GRIP FORCE GEN 123/GEN 123SC ADPATER mates completely to the back strap of the GLOCK frame, permitting the shooter's hand to conform to the frame in a more secure manner. This offers more control and allows the shooter to index the pistol on target more efficiently.